The Angenieux 12:1 series of zooms are some of the best performing zoom lenses ever made for the 16mm and Super 16mm format. However, because of their relatively large size, they should be used with a lens support. Also, the original zoom gear is so small relative to the size of the large focus barrel, that it is nearly impossible to use a zoom motor mounted on the lens. Our solution was to make a new zoom gear, the same size as the original focus gear. This zoom gear is mounted on a collar that cover the area where the rubber ring was situated on the Zoom ring. 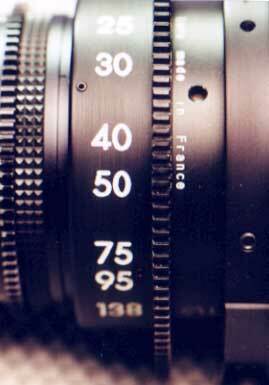 Focal length marks are engraved on this collar so camera assistants can work the right side of the camera. The T-stop can arleady be read on the right side, and we offer custom-engraved follow focus discs so that focus witness marks can be read on the right side. 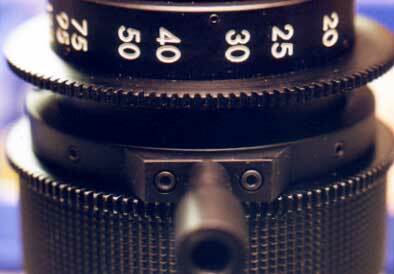 This makes the lens “workable” from both sides, like the latest 35mm zoom lenses. We will be adding more photos of other Custom Modifications we have performed in the future. 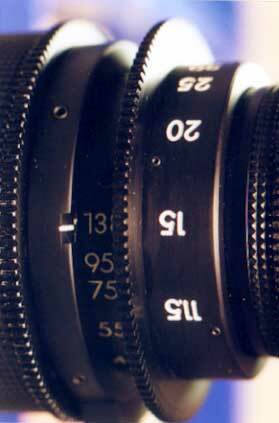 Lens Support Ring seen from the bottom, Lens Support Column is visible. This is the standard Column for use with a standard Support Bridge on ARRI 15mm or 19mm Support Rods. Column can be easily removed and replaced with a shorter one for use with ARRI Lightweight Support.